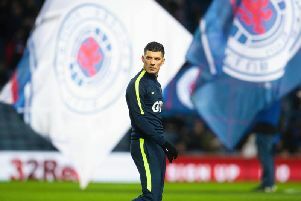 Rangers manager Steven Gerrard insists Scott Brown should be punished by the authorities for antagonising his players. The Celtic captain was at the centre of three flashpoints as the Hoops defeated their rivals 2-1 on Sunday afternoon. Alfredo Morelos was shown a first-half red card for an off-the-ball elbow on Brown. Ryan Kent then appeared to throw a punch at the midfielder after James Forrest had netted Celtic’s late winner. After the full-time whistle Brown was involved in another incident as he was confronted by Andy Halliday following some celebrations in front of the Rangers support. Halliday was later shown a second yellow card for his part.